Protecting your smile while playing sports is essential when you have braces. Mouthguards help protect your teeth and gums from injury. If you participate in netball, boxing, hockey, football, gymnastics, martial arts, tennis, rugby, athletics, skateboarding, soccer, surfing, volleyball, water polo, weightlifting or wrestling, it is recommended that you wear a mouthguard. 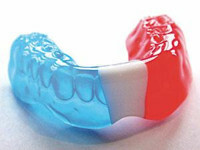 Pre-made mouthguards and boil-and-bite mouthguards can be purchased at most sporting goods stores, while custom-made mouthguards are specially designed by your orthodontist to provide optimal protection against mouth injuries. If you wear braces or a retainer, it is imperative for you to wear a mouthguard during contact sports. Dr Shaboodien can show you how to wear a mouthguard properly and how to choose the right mouthguard to protect your smile.